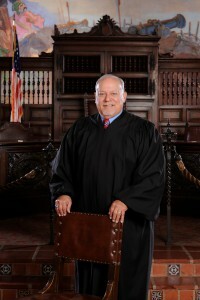 Judge Frank Ochoa retired in January, 2015 from the Santa Barbara Superior Court after more than 32 years on the trial court bench. When first appointed to the Santa Barbara Municipal Court by Governor Brown in 1983 he was the youngest judge in the state at the time. He also became the court’s first Hispanic judge in the twentieth century. He served on numerous statewide judicial committees and task forces and was temporarily assigned to the local division of the California Court of Appeal. Over the years Judge Ochoa has been the trial court judge in numerous high-profile cases and he rendered many decisions which had wide-ranging impacts. He developed the local adult and juvenile court drug court programs as well as the CADRe, or Court Administered Appropriate Dispute Resolution, program. He was the Presiding Judge of the court through the countywide court consolidation process as well as the transition from county funding to a statewide court funding base and administrative structure. He has lectured and taught judges and lawyers on a wide variety of topics and has taught law related courses at the Santa Barbara College of Law and the University of California at Santa Barbara. He now operates a private judging practice in the areas of mediation and arbitration; as well as providing other dispute resolution and consulting services. Judge Ochoa received BA Degrees from UCSB in History and English. He credits both of his major areas of study for providing a foundation for his notable career in the law. He has taught the history of Latina/os in America with respect to property rights, citizenship, criminal case processing, structural representation in trial and grand juries, and civil rights, among other areas of law.